Just a quick second post today to share details on an amazing blog giveaway. Today's card features the adorable scarf wearing owl from Pink Cat Studio. The papers are from a huge 12x12 DCWV stack my daughter brought home the other day. She works at TJ Maxx and lately they've been getting some stamps and paper at work so she bought this one for me for a few dollars. It has a lot of nice variety in it so I'll get lots of use from it. The owl was colored with Copics and mounted with foam dimensionals. 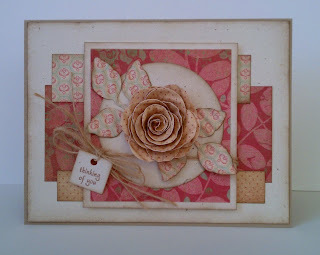 I also added a scalloped border using the largest scalloped die from A Muse Studios. For the finishing touch, I added a couple of pieces of bakers twine from The Twinery tied in to a bow. Oops, how did it get to be Wednesday already. Sorry for my lack of posts this week but we've have cloudy overcast days all week so taking photos has been a challenge. Since I haven't posted yet this week I'll go ahead and share two cards with you today. The first one uses paper from Authentique and an Itty Bitty stamp from Unity (co-brand with Authentique). I also used Papertrey Ink's die to cut out the piece where the dress form is mounted and saved that pieced for my next card. 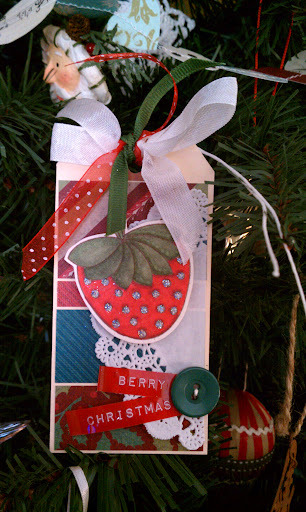 This card uses the die cut piece from the card above as an ornament. 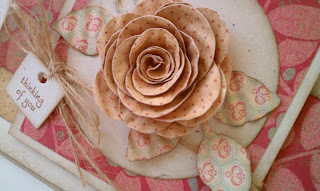 I just added the sentiment strip and a bow and mounted it to a choc chip mat. The choc chip mat was embossed with the Papertrey Ink Canvas Impression Plate. Thanks so much for stopping. I hope you're all having a wonderful Wednesday. Happy Stamping! Have you seen the adorable Matching Socks stamp from Unity?! 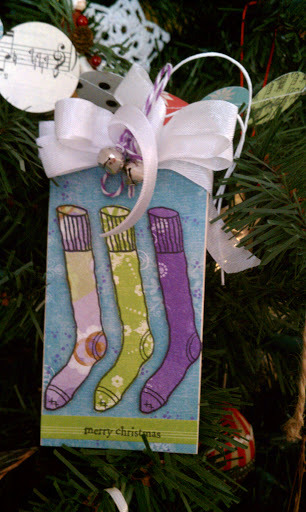 I just love it and thought it would be fun to use one of the socks from the stamp to create Christmas stockings. I stamped the socks on patterned paper and fussy cut them to mount them on a die cut oval with foam dimensionals. The oval was also mounted to the card with foam dimensionals along with the sentiment tag. For the finishing touch, I wrapped some twine around the card and made a bow. The papers are from a recollections paper pad from Michaels and the scallop border was made with the smallest die in the A Muse Studio scallop border dies. I know this is my second post of the day but I wanted to add this card to the Unity Friends with Flair post found here. Thanks so much for stopping. I hope you're having a great Friday. Happy Stamping! I was looking at Chicken Strings from Whipper Snapper Designs the other evening and decided he would make a fun Christmas card. I pulled out some Good Cheer papers from October Afternoon and computer generated the "I'll have a blue Christmas without you" piece. I fussy cut around the chicken and his microphone to mount them on the card and then I added a bit of holly leaves and berries (mini pearls colored with a red Copic) to the microphone. For the finishing touch I made a little embellishment with some tulle, twine, holly spring and a paper rose (using the small rose die from My Favorite Things). Thanks for stopping by. Hope you've got a fun weekend planned. Happy Stamping! Today's card features the Gnomebody Like You set from Wilson Designs and some journaling cards from October Afternoon. When I saw the cute little deer on the October Afternoon Journaling card I had to pair it with the deer stamp from Gnomebody Like You. I stamped the greeting on the journaling card with Chocolate Chip ink and then filled it in with while gel pen to help it stand out. Inspired by a recent Hero Arts video by Jennifer McQuire, I added some random pearls and rhinestones to my card. The pink satin ribbon is from A Muse Studio. Today's card features one of the stamps from the Forever Friends set by Unity. As our lives get busy and we may not talk as often as we used to, my friends are still very important to me and I think this is the perfect message to send as a reminder to let them know I'm thinking of them. In addition to the stamp, I used some star paper from October Afternoon and patterned paper from My Mind's Eye. I also used my Sixxix star die to cut six stars which I layered into three stars and added a gemstone to the center of each. I colored the star in the sentiment piece with a Copic and added a matching gemstone to the center. Thanks so much for stopping. I hope you're having a terrific Tuesday. Happy Stamping! Today's card doesn't have much stamping. Just a simple little tag with "friend" stamped on it, otherwise I focused on the patterned paper (Capella by Basic Grey). I die cut a butterfly out of felt with the A Muse Studio butterfly die and added a broken piece of jewelry that I had in my stash to the center. Finally I added some lace and cotton floss. Thanks so much for stopping. I hope your week is off to a great start. Happy Stamping! Just a quick post on this very chilly Friday. It is only 10 degrees here this morning with a high today of 27. I guess it should be expected since it is now December but we've been pretty spoiled with nice temps this fall. Anyway, on to today's card which features stamps and dies from a.muse|studio and papers from Basic Grey's Sweet Threads collection along with some vintage lace and twine from The Twinery. I also used the label die from Papertrey Ink to layer the a.muse|studio die. Thanks so much for stopping. I hope you're all having a fabulous Friday. Happy Stamping! 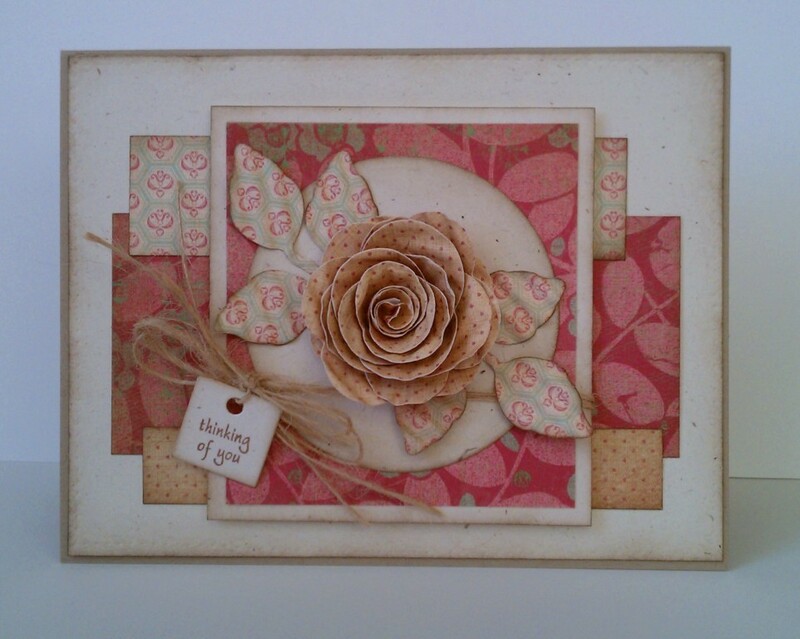 Today's card is for the sketch challenge (SC361) posted yesterday on Splitcoaststampers. It's a great sketch for using up scraps. For my focal piece I went with a paper rose. To create the rose I cut two pieces using the MFT large rose die and then ran them through my crimper a couple of times to give them some added texture. I rolled the two pieces together to get a fuller flower. The leaves are from the Spellbinders Foliage set and were also run through my crimper. The tag is from the Tiny Tags Cuttlebug set and the greeting is from a limited edition stamp set from Clear and Simple Stamps. Thanks so much for stopping. I hope you're having a great day. Happy Stamping!